In the countryside around the town of Durobrivae there was a number of villas, or large farmhouses, each with their own estate. The wealthy owners often built and decorated their homes with all the comforts of Roman civilisation. Many had hypocausts or undefloor heating systems to keep them warm in winter and the floors of major rooms were sometimes decorated with mosaic made of thousands of small tiles called tesserae. Some of these mosaics have survived and can still be seen. Of course you needed many slaves to run your farm profitably and stoke the fires for your heating system-life for the slaves was probably far from luxurious! 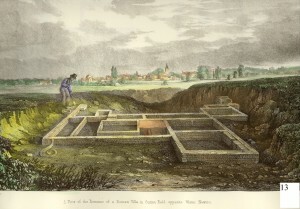 In fact we have found the remains of at least 7 Roman villas around modern Castor and the town of Durobrivae. each villa must have been the home of a wealthy farming family who farmed their own estate . 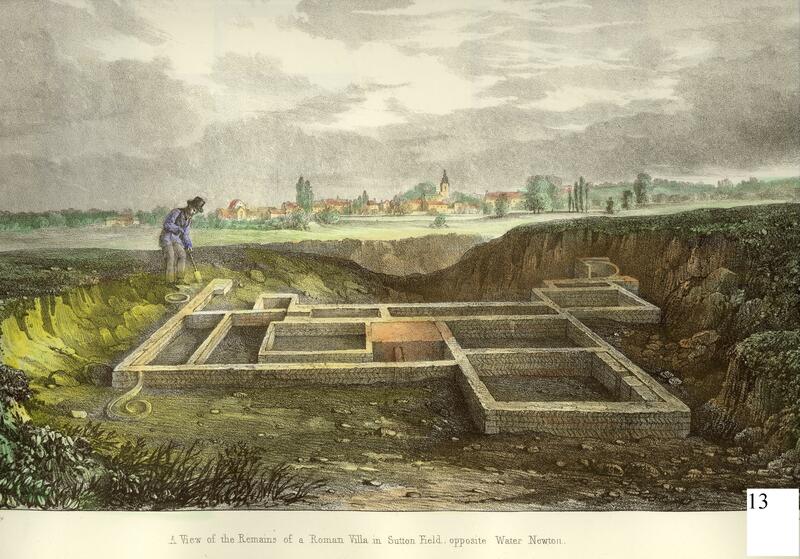 The villa on Mill Hill had a fine view over the Nene valley and was excavated by Edmund Artis in the 1820’s. He found at least one room with a mosaic floor which he illustrated in his book ‘Durobrivae’. The Romans brought with them improved ways of farming such as rotating the various crops and new ways of animal breeding. All this would have increased food production so that produce could have been sold in the local town markets or exported to other parts of the province. Grain could have been stored in granaries over the winter or exported abroad. One thing the Romans definitely didn’t have was potatoes !